Gisenyi Hotels, Gisenyi/ Rubavu Accommodation, Rwanda Rubavu, Tourist Attractions/ Activities-For all your accommodation and hotel needs in Gisenyi Rwanda. Enjoy our reliability and long standing relationship with hotels, lodges and guest houses in Kigali, Ruhengeri, Butare, Cyangugu and Kibuye. Visit Gisenyi and stay at Kivu Sun Serena Hotel, Palm Beach Hotel, Stipp/Stipps Hotel, Peace Land Hotel. Located on the shores of lake Kivu, Gisenyi (Recently renamed Rubavu) is a popular lake side resort. Across the border lies Goma in the DR Congo. Goma is peaceful and there are taxi services linking it to Gisenyi and Kigali. However a majority of the tourists use Gisenyi as a base to explore Goma and the nearby active volcano of Nyiragongo plus track gorillas in Virunga National Park. Our Gisenyi/ Rubavu hotel directory below features hotels, guest houses and lodges in Gisenyi(Rubavu), Rwanda. The Gisenyi (Rubavu) Hotel Directory is just a guideline as to the prices of the hotel and these are subject to change. 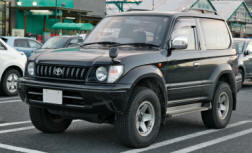 Upon reservation request, we will confirm the actual price and get back to you. Gisenyi is approximately 160 Km from Kigali, 70 Km from Ruhengeri. 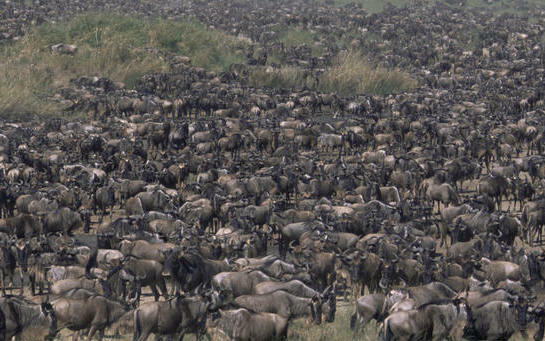 It takes about 3 hours to drive from Kigali and about an hour and half from Ruhengeri. The road from Kigali to Gisenyi via Ruhengeri is smooth with very sharp corners. The scenery is un believably beautiful with lots of agricultural terraces. The four star property is located at the beach front. All the rooms are air conditioned. Kivu Sun Serena hotel has got an out door swimming pool, internet facilities, conference and banquet facilities, tennis court and a gym. The beach in front of the hotel is private and available for hotel guests only. 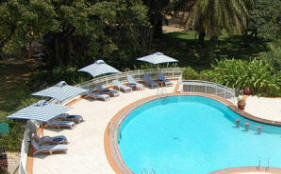 Located just a few metres from Kivu Sun Serena, the Stipp Hotel is a renovated old colonial house. It has a bar restaurant and a swimming pool. color TV with 5 international channels via satellite, telephone, hot shower and bath,daily maid. service. The hotel has a business center with computer, e-mail, printer and copy machine, high speed wireless internet, French Restaurant, “La Fringale”, with views of Lake Kivu , outdoor restaurant/barbeque with a fabulous grill, bar, and TVs. Regina is the oldest hotel in Gisenyi/ Rubavu. It was built during the colonial era and an ideal budget property with wide verandas over looking the lake high ceiling and wooden floor. The best rooms are large airy and self contained. Palm Beach hotel is a budget popular with the locals and tourists. It neighbours the Kivu Sun Serena. The property extends across the road to the beach front where there is a small bar. However as of now the beach is public. Originally a restaurant, the Paradise Malahide Hotel has been expanded to include accommodation. 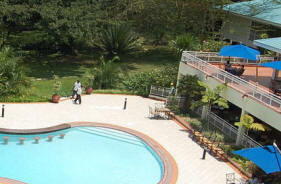 The hotel is located at Rubona, 6 Km from Gisenyi. The hotel has its own bar and restaurant all enjoying superb views of the lake. Gishamwana Island with its coffee plantation, picnic and campsites. The active volcano of Nyiragongo in the DR Congo which erupted recently burring half of Goma. Note that hiking Nyiragongo takes two days. Bring your camping equipment as the metal huts are no longer available. Bring a warm sleeping bag as it is very cold. However from the Volcano you will have superb views of the lake, the towns and the surrounding area. 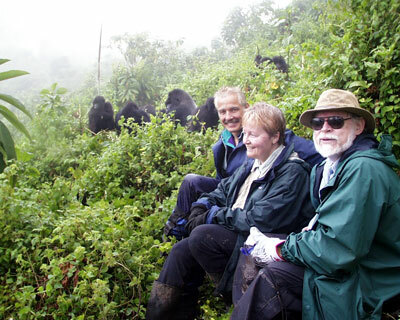 The Virunga National Park in DR Congo - ideal for gorilla tracking. Lake Kivu with its beach ideal for swimming, boat rides and sun bathing. The tea and banana plantations. 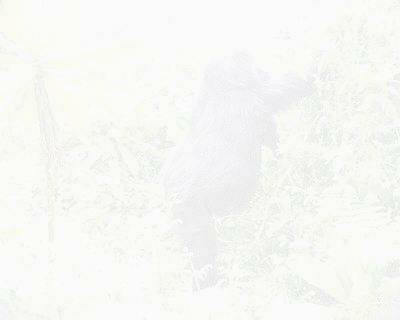 It is possible to track gorillas from Gisenyi. Gorilla safaris depart Gisenyi around 05:30 Hrs so that they can reach Kinigi Park headquaters at around 06:45 Hrs. Madam Rosamond Carr's Orphanage (Imbabazi) has been moved to its original site at Mugongo about 30 Km midway between Gisenyi and Ruhengeri. This was the original site of the Orphanage when the war started. However due to continued insecurity, it was moved to Gisenyi. Rosamond Halsey , a fashion illustrator in New York married an English big time hunter Kenneth Carr. In 1949, they moved to Africa (Congo) where they eventually divorced. In 1955, Rosamond Carr moved to Mugongo in Rwanda to manage a flower plantation which she later bought. It is here that she wrote the "Land of a thousand Hill; My Life in Rwanda", which chronicles her love of Rwanda. Following the outbreak of 1984 civil war, she evacuated to USA but returned in August of the same year to find all property looted and destroyed. Together wit\h her farm manager, Sembagare they founded Imbabazi. Due to insecurity, it was moved to Gisenyi but in 2005, the orphanage was moved back to Mugongo.